Americans are split on the acceptability of mocking religion, but most believe freedom of speech should still take precedence, a new HuffPost/YouGov poll found. In the survey, 63 percent of Americans, including virtually identical percentages of Republicans and Democrats, said it's more important to protect free speech than to shield the dignity of religious beliefs. Just 19 percent said the dignity of religious beliefs was more important, while another 18 percent were unsure. The survey was taken just after 12 people were killed in an attack on the Paris magazine Charlie Hebdo, known for its religious satire. The next issue of the magazine is slated again to include cartoons of Muhammad. "We will not give in -- otherwise all this won't have meant anything," Richard Malka, the magazine's lawyer, said on French radio, according to The Telegraph. According to the survey, Americans don't think the media should react to the threat of violence either by censoring themselves or by ramping up the publication of provocative religious content. 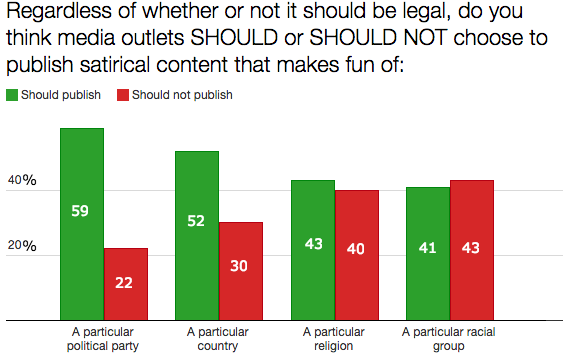 While 15 percent wanted to see more religious satire and 23 percent wanted less, 43 percent said Western media shouldn't alter their content at all. News outlets have struggled with the question of whether to show the controversial cartoons previously published by Charlie Hebdo, with the major broadcast networks and the Associated Press choosing not to run the images. Eighty percent of Americans, however, said media organizations "have an obligation to show controversial items that are newsworthy, even if they may offend the religious views of some people." That vast support for the right to publish, or republish, objectionable content does not translate into widespread comfort with the idea of mocking religion. Though 65 percent said cartoons mocking religious figures are acceptable, just 22 percent called them completely acceptable, while 43 percent said they were acceptable but in poor taste. Most Americans think media outlets should publish content satirizing political parties or other countries, but they're about evenly split on whether race and religion should receive similar treatment. Which religion is being mocked matters. Americans said by a 2-point margin that ridiculing Christianity is unacceptable, but found ridiculing Islam acceptable by a 10-point margin. Protestants and Catholics, majorities of whom don't think Christianity should be mocked, are both about equally divided on ridiculing Islam. Republicans, who split on mocking Christianity, said by a 23-point margin that mocking Islam is fine. By contrast, about three-quarters of atheists are fine with satirizing Christianity and Islam, while Americans aged 18 to 29 are actually more likely to think ridiculing Islam is unacceptable than to think mocking Christianity is. Another major dividing line throughout the survey results is gender. Men are only slightly less likely than women to say they would be offended by people making fun of their own religious beliefs. But men are over 20 points more likely than women to say the media should publish satire aimed at specific races or religions and to say it's acceptable to ridicule both Christianity and Islam. The HuffPost/YouGov poll was conducted Jan. 7-9 among 1,000 U.S. adults using a sample selected from YouGov's opt-in online panel to match the demographics and other characteristics of the adult U.S. population. Factors considered include age, race, gender, education, employment, income, marital status, number of children, voter registration, time and location of Internet access, interest in politics, religion and church attendance.